I now get YouTube Will it happen again? I have failed my Wired “traveling too much test”. I buy Wired at the airport, and if I go on a trip and already have read the current copy, I am traveling too much. The effects of travel are even more wearing when you have an uncomfortable flight. I am on my way back from a mini tour of the mid-west with Brad Neuberg. 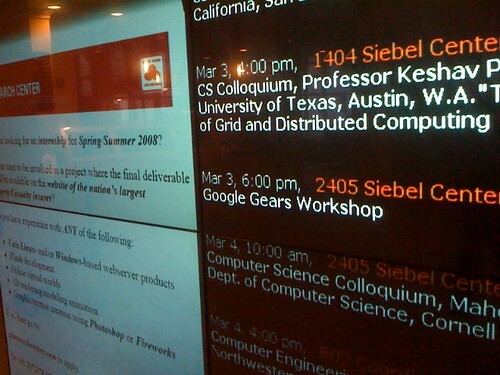 We hit the University of Illinois Urbana-Champaign, and the University of Michigan, to chat with students about Gears. It probably wasn’t the smartest time of year to have a March trip, and it was bloody freezing most of the time. This also lead to delays on 4 out of 6 of my flights. Ah the fun. Due to a cancelled flight I got put on another one, and ended up at the back of the plane in a tight corner. There was no way I could use the ole laptop, so I was putting all of my hope in the in-flight movie. No, fortunately they didn’t broadcast The View, but I was in the position where I could barely see a television set in the sky. A full third of the set was obscured by the curve in the plane itself. I looked down the line to the next one to see if a smaller view would give me more content, but the curve kicked in for all sets. The colour on the set closest to me was off too. It reminded me of the monochrome games that I loved on the ZX Spectrum. Oh ye olde rubber keyboard. Q-A-O-P-Space were all very worn! When the entertainment kicked in, we got to see Ebert & Roeper tell us about the movie we are about to see. You get the added bonus of showing half of the actual movie as they pre-explain. Just what you need. In this case the film they were blathering about was Becoming Jane. When I am on a plane I tend to revert a few years and want some silly shoot ‘em up entertainment. The new Rambo, where Sly literally knocks someones block off would have been a good choice. But a period piece about Jane Austin? Do I really want to find out about the REAL Darcy? Anne Hathaway plays the part, and although she does a fair job at it… all I can think about is that Princess movie that she was in with Mary Poppins. Somehow it feels like I have seen that movie, even though I never actually have. It has been on TV so often that I have picked 80% of the picture as I flick through channels over time. Being stuck in the back of the plane meant that I was hot. When you are hot on the plane your only choice is to turn up the minute air jet from above. I turned it up to the max, which barely helped, but had a bad side effect. It kept making the duct in my right eye release saline. It was streaming. This meant that the others in my row thought I was crying over the plight of Jane and the loss of her love due to pride and prejudice. Oh the shame! But, back to the reason why I was putting up with the flights, with their re-reads of Wired. Reading about the cockiness of 37signals never gets old! It was really cool to start off the trip in Champaign. Talking about Gears, at the birthplace of the browser was pretty cool, especially on the day that Marc Andreessen blogged about hanging with Barak. These kids could do that too. Brad and I got to tour the ACM where we saw a bunch of cool hacks and fun robotics. These students were smart. I felt lucky to get to the event on time. After I finally got into the airport, which is tiny, I waited for over an hour for a cab that never came, so I ended up jumping on a bus and trying to work out what the hell I was doing. I made it to Brad’s hotel in time for us to walk over to the event. A few delays, and many red carpet club hours later, I was in Ann Arbor. We had an equally good time with the gifted students that showed up. This crew didn’t wolf down the pizza in 30 seconds flat like the fighting Illini the day before. They were equally smart though, and I was really excited to see postings by one of them to the Gears list. He is porting Gears to 64bit Linux. Nice! Thanks to the students from both schools for showing up, and I can’t wait to see what you come up with. 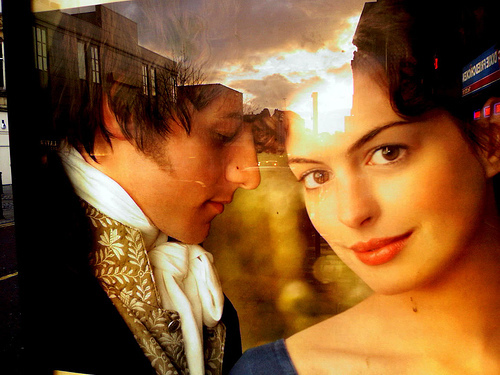 I <3 becoming jane!!! JAMES MACAVOY IS SO CUTE. I wish it had a happy ending though. Why couldn’t they just have tweaked history a widdle bit?? I’m writing this from good ol’ Champaign. I totally didn’t know about this event! 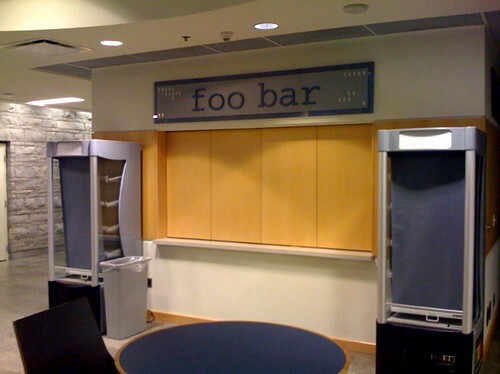 I would have loved to have attended. Ah well. Maybe next time. Glad you made it home safely.